Rain at Sepang International Circuit F1 2011 post party concert, Malaysia. 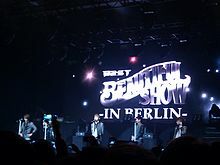 During the Korean Wave (Hallyu), K-pop artists took their concerts outside of South Korea, and with increased exposure, became a huge success in other Asian countries, then started to expand to western music markets outside Asia. The word Hallyu first originated in China during 1999 by journalists that were surprised how fast it spread in China. One study that examined the number of concerts held between 2013 and approximately May 2016, indicated that East Asia still had the most concerts, but their numbers were tapering, while North America, South America and Europe were showing consistent growth. The top three countries with the most concerts abroad were Japan, China and the United States. The study found most tours were those of male groups, with solo acts and female groups a small percentage. The top ten touring acts, by the numbers, were Big Bang, Super Junior, 2PM, TVXQ, SHINee, EXO, Girls' Generation, F.T. Island, CNBLUE, XIA, Infinite and B1A4; with XIA the top solo act and IU the top female solo act. This is a list of all notable K-Pop concerts held outside the Asian continent. ^ Lee, Sue Jin. "The Korean Wave: The Seoul of Asia" (PDF). Elon University. Retrieved 13 November 2016. ^ a b c d Benjamin, Jeff (May 3, 2016). "K-Pop Concerts Continue to Grow Outside Asia: Exclusive Infographic". Billboard. Retrieved May 5, 2016. ^ Zimmer, Cindy (March 23, 2012). "Review: 2K12 Korea Night – The Performers (at Canadian Music Week)". ATK Magazine. Retrieved January 4, 2015. ^ Sylphid (May 25, 2012). "[Concert Review] MBC Korean Music Wave in Google". Soompi. Retrieved January 4, 2015. ^ Sylphid (December 23, 2012). "Performances from the SBS K-Pop Super Concert in America". Soompi. Retrieved January 4, 2015. ^ Larsen, Peter (October 12, 2012). "K-Pop wave rolls into Irvine at KCON '12". Orange County Register. Retrieved December 15, 2014. ^ "TEEN TOP announces 5-city European tour". Allkpop. 2012-12-20. Retrieved 12 January 2013. ^ Oak, Jessica (March 26, 2013). "f(x) Talks About Performing as First K-Pop Act at SXSW". Billboard. Retrieved December 13, 2014. ^ "Korean bands tour North America". Hancinema. April 18, 2013. Retrieved January 4, 2015. ^ a b c "South American ELFs break open those piggy banks, Super Junior's 'Super Show 5' is heading your way". allkpop.com. 2013-03-11. Retrieved 2016-12-05. ^ Brown, August (August 22, 2013). "Los Angeles' KCON aims to take K-pop to another level for fans". Los Angeles Times. Retrieved December 15, 2014. ^ Shin, Diana (December 18, 2013). "NU'EST Holds Successful Brazil Concert and Spreads the Hallyu Wave in South America". KPopStarz. Retrieved December 15, 2014. ^ "NU'EST to Hold Brazilian Concert and Fan Meet in December". KPopStarz. October 21, 2013. Retrieved December 15, 2014. ^ Oak, Jessica (February 24, 2014). "'K-Pop Night Out' Returns for SXSW 2014 With HyunA, Jay Park & More". Billboard. Retrieved December 13, 2014. ^ Admin (2013-12-20). "Jazzy Group of Companies – Boyfriend First U.S Showcase Live in the USA". Jazzygroup.com. Retrieved 2016-12-05. ^ Berger, John (July 12, 2014). "M.Pire brings K-pop to Korean Fest". Honolulu Pulse. Retrieved December 15, 2014. ^ "BTS to hold a fanmeeting in August in Brazil" (in Portuguese). brazilkorea.com.br. June 12, 2014. Retrieved August 17, 2018. ^ "Eric Nam Toronto Showcase + Fan Meet & Greet". www.facebook.com. Retrieved 2016-09-18. ^ Jeff Benjamin (2014-09-09). "B1A4 Road Trip Tour 2014: Four U.S. Dates on 'Road Trip' Including New York, Los Angeles, Dallas & Chicago". Billboard. Retrieved 2016-12-05. ^ Jeff Benjamin (2014-10-15). "2PM U.S. Tour Dates: New York, Los Angeles, Chicago & Dallas for World Tour 'Go Crazy'". Billboard. Retrieved 2016-12-05. ^ Jeff Benjamin. "VIXX US Tour 2014: Chicago & New York Concert Dates". Billboard. Retrieved 2016-12-05. ^ "South by Southwest (SXSW): K-Pop Night Out". SXSW, LLC. Retrieved January 14, 2015. ^ March 31, 2015 (2015-03-31). "GOT7 to Visit Three American Cities for First U.S. Tour". Soompi. Retrieved 2016-12-05. ^ by btsdiary (2015-07-09). "[INFO] BTS Will be at Highlight 2015 tour in USA and Canada on Sept. 22-27.2015". Btsdiary.com. Retrieved 2016-12-05. ^ "The Korea Times Music Festival | The Korea Times Music Festival". Ktmf.koreatimes.com. Retrieved 2016-12-05. This page was last edited on 22 March 2019, at 14:31 (UTC).